Saw this great image on Facebook, and as the owner of two large (~50 pound) dogs, I was compelled to share it. Great examples of how to get yourself bitten by a dog who doesn’t know you! I’m constantly amazed by total strangers who think it’s a good idea to run up to a dog they don’t know, without pausing to inquire to the dog’s owner about temperament and behavior. I have a lot more respect for people who will say something complimentary about a dog to the owner, ask politely if the dog is friendly or if it’s okay to pet the dog, and then treat the dog calmly and respectfully while being a friendly person. On the flip side, I’m dismayed by parents who don’t teach young children not to go running up to a strange dog and grab at it — particularly when a dog is bigger than the child! That’s a dangerous proposition for anyone, but for a small child, it makes me especially nervous. Every time a kid charges up to my dog shrieking and waving his arms in the air, I pray that I react quickly enough to keep my dogs from responding negatively… and a small part of me secretly hopes that my dogs scare the hell out of (without actually hurting) the kid, to teach him a lesson about behaving around animals they don’t know. And yes, I acknowledge that an animal is still an animal, and sometimes will react out of fear or dominance or territoriality or who-knows-what. Sometimes a dog will react negatively for no apparent reason, even if you follow all of the “rules” of interacting with them, and that can be frightening and intimidating. 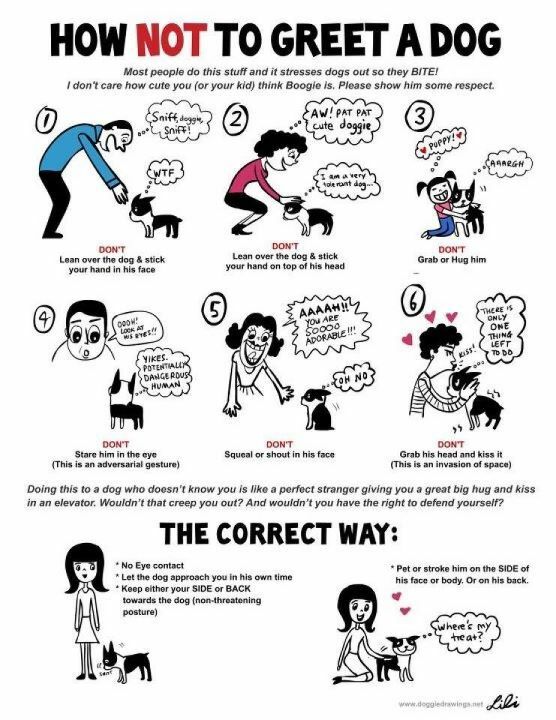 But c’mon, people — a few common sense rules of thumb will greatly increase the likelihood that both you and the dog have a good day. This entry was posted on Friday, February 17th, 2012 at 8:28 am and is filed under Uncategorized. You can follow any responses to this entry through the RSS 2.0 feed. You can leave a response, or trackback from your own site. I love that illustration! I am forwarding it to all my vet tech friends, as well as putting it up at the barn where I work. Our barn is linked to the public access areas of VanCortlandt Park, and we not only have to constantly monitor the people that ignore the HUGE signs to keep away from the horses and stables, we have to run interference with the public and their dogs, too.